Ausführlich wird die Ventralplatte mit ihrem Ringwulst für die Verankerung des Pygidiums dargestellt. Die Oberflä­chenstruktur der Wangenstachel wird bei Lonchodomas rostratus eingehend erörtert. In der zeitlichen Abfolge der Arten ist bezüglich der Form des Pygidiums ein Trend von eher gerundeten Seiten hin zu einem Schwanzschild mit geraden Seiten und damit einem dreieckigen Grundriss im oberen Oberordovizium zu verzeichnen. In einer Tabelle werden die Trends an Panzerteilen der einzelnen Arten gegenübergestellt. Bei Lonchodomas balticus konnten das Hypostom sowie die inneren Zapfenfortsätze der Fossula entdeckt werden. The author has collected within a timespan of approximately 50 years a vast number of fossils originating from erratic boulders especially of limestones of Ordovician age. This also includes representatives of the family Raphiophoridae. The following genera are present in erratic boulders of lower middle Ordovician age up to upper Ordovician age: Rhombampyx, Globampyx, Ampyx, Lonchodomas and Cnemidopyge. This publication deals with fossils belonging probably to 20 different species. Seventeen of them are determined to species level. Of Lonchodomas volborthi two subspecies are known. Among the material there are seven hitherto undescribed species of the genus Lonchodomas. Five of them are described, named and figured in detail. They belong to the following new species (in alphabetical order): Lonchodomas goehrensis spec. nov., L. postrostratus spec. 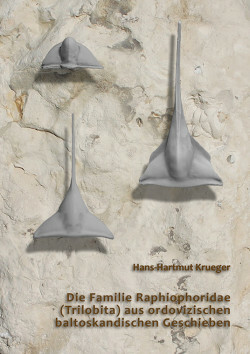 nov., L. rhebergeni spec. nov., L salemensis spec. nov., and L. starki spec. nov. A further Lonchodomas species was found (Lonchodomas spec. A) which is perceived as new and not formally described and named because of its only fragmental cranium and free check (librigena). Fossils of two further species could only be determined to genus level: Lonchodomas spec. B and Cnemidopyge spec. Both are mentioned and figured in the current paper, because the fossils were found in special limestones of Ordovician age and which deserve a distinct position in the stratigraphical timetable. There is a detailed description of the ventral plate and its ring-shaped bulge. These structures are shown to be evident to fix the pygidium during enrolment (coaptation). The structure of the surface of the librigenal spines of Lonchdomas rostratus is described and figured. As far as the shape of the pygidium is considered, there seem to be a tendency to change from a more roundly outline to a triangular shape in the upper Ordovician forms. A table is worked out to summarise and compare the trends and shapes of different parts of the exoskeleton in the different species. In Lon­chodomas balticus the hypostome and the inner extensions of the fossil were discovered.